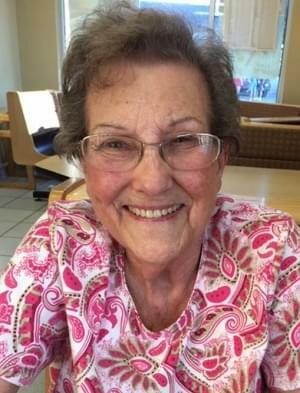 Anna Fae (Cameron) Sisson, 90, of Centralia, passed away Tuesday, April 16, 2019 at her home. Anna was born and raised in Walnut Hill and after she married, Bill Sisson, Sr., she moved and raised her family in Centralia. Anna was a member of the Calumet Street Christian Church in Centralia. She enjoyed listening to Church Hymns. She was an avid St. Louis Cardinal’s Fan and loved the color red. Anna enjoyed cooking and making sweets. She loved spending time with her grandchildren, family and friends. Funeral Services for Anna Fae Sisson will be held Tuesday, April 23, 2019 at 1:00 PM at the Sutherland-Garnier Funeral Home in Centralia with John Willis officiating. Burial will follow at Hillcrest Memorial Park in Centralia. Visitation will be held Tuesday, April 23, 2019 from 11:00 AM to 1:00 PM at the Funeral Home. Memorial donations may be made to the Calumet Street Christian Church and Oil Belt Christian Service Camp and will be accepted at the Sutherland-Garnier Funeral Home at 235 North Sycamore Street Centralia, Illinois 62801, (618)532-3523, who is honored to be of service to the Sisson Family. Online condolences may be made to the family by visiting www.sutherlandfuneralhome.com. Anna is survived by seven children: Bob Sisson and wife Carol of Hamilton, Ohio, Connie Futrell and husband Don of Chula Vista, California, Gloria Neafus and husband Don of Springtown, Texas, Marilyn Hutton of Centralia, Cynthia White and husband Doug of Dix, Dave Sisson of Walnut Hill and Lisa Sprehe and husband Tim of Centralia; twenty-three grandchildren, forty-six great-grandchildren, and one great-great-grandchild; son-in-law: Richard Shipley and wife Cathy of Centralia; a sister: Donna Drenchpohl of Champaign; two brothers-in-law: Richard Sisson and wife Nancy of New York and Julius Sisson and wife Marilyn of Litchfield; a sister-in-law: Naomi Roark Taylor of Arizona; several nieces and nephews. She was born June 26, 1928 in Walnut Hill, daughter of Ralph Cameron and Edith (True) Cameron. She married Bill Sisson, Sr. on November 10, 1946 in Centralia and he preceded her in death on January 2, 1992. She was preceded in death by her parents, husband, a daughter: Carol Shipley, a son: Billy Dean Sisson, and a special friend: Neil Burge.